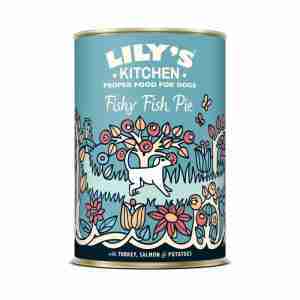 Lily’s Kitchen Fish Pie with peas is a delicious fishy dish for dogs, containing all the nutrients your pet needs to stay healthy while soothing sensitive stomachs. This wet pet food is suitable for all adult dogs, seniors and puppies over the age of four months. It contains no artificial ingredients, only sustainable salmon, herring and turkey. Each dish is therefore packed full of Omega-3 fatty acids and Vitamins D and B12, which are essential for maintaining healthy skin, organs and joints. It’s also 100% free from fillers or grains. The fibre in each dish comes from market vegetables, which are easier for pets to digest. A mixture of botanical herbs creates a taste that dogs enjoy and provides a variety of benefits: burdock and goldenrod help to keep the liver, bladder and kidneys working well, and cleavers rich in antioxidants helps maintain overall wellbeing. Wheat fillers are commonly found in many types of pet food, but if your dog has an allergy or sensitivity to grains this can cause problems. He may end up with a bloated tummy and become lethargic after meals while his stomach struggles to process the food. Feeding your pet with Lily’s Kitchen fish pie with peas can help to minimise discomfort because it is entirely free of grains or fillers.Celery seeds rich in vitamins and minerals, including vitamin C have also been added to each bowlful, which helps your pet to stay healthy. Salmon (15%), Herring (15%), Turkey (30%),Organic Potatoes, Organic Peas (4%), Organic Carrots, Spinach, Vitamins & Minerals, Hemp Oil (Source of Omega 3 & 6). Botanical Herbs: Golden Rod, Nettle, Rosehips, Marigold Petals, Cleavers, Kelp, Alfalfa, Milk Thistle, Dandelion Root, Burdock Root, Celery Seeds. Crude Protein 10.3%, Crude Fats and Oils 6.6%, Crude Ash 2%, Crude Fibres 0.4%, Moisture 75%. Make sure that your dog has access to plenty of fresh water. This is an excellent quality dog food that is really worth the extra money. When opened it smells great and you can see it contains real meat and vegetables. My little old dachshund loves it and has been given a new lease of life! It has really cheered him up. I now tell him he eats better than I do! My 5yr old West Highland dog " Westley" loved all, so you have a convert. Our two pugs absolutely love this dog food.They are fussy eaters but not anymore.I have tried a few other foods but they where not that keen until I tried Lilys Kitchen .They enjoy the variety and with no additives only natural produce it's a great product. we have 3 terriers, a Patterdale, a Patt X Jack and a Jack Russel, and they love Lilys kitchen tinned food and holistic whole bake meal...they run in from the garden at the shout of " DINNER " and clean the bowls, tails wagging...they then swap bowls to see if anyone else has left anything!!!!!!! great food at last....Nothing unneccesary added all good fresh ingredients, and I love the addition of the fruits and herbs..we have a very happy very healthy trio of Terriers!!!!! thanks guys. This product is great my dogs love it..Why do you say 6 cans from 10.99 when your cheapest is 12.99..